Presentation by guest curator Joe Miller: 5pm Tuesday, August 26, in Art room 133, San José State University. Natalie and James Thompson Art Gallery, School of Art and Design, San José State University. A major figure in 20th century graphic design’s International Style and co-founder of the historic Ulm School of Design (Hochschule für Gestaltung Ulm), graphic designer Otl Aicher (1922–1991) was a man of legendary order and planning. 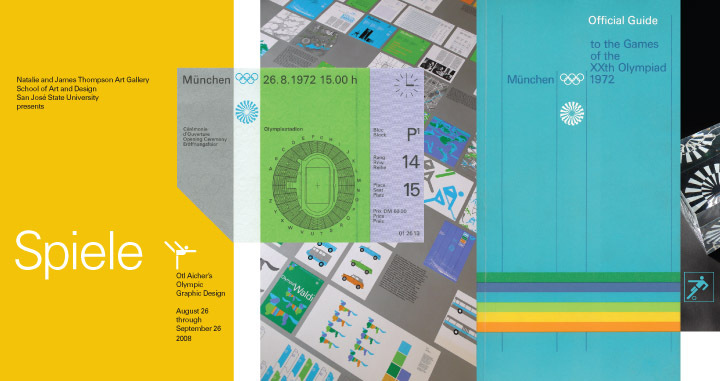 Aicher’s comprehensive work for the 1972 Munich Olympics perfectly embodies his philosophy and is the definitive example for today’s graphic identity and branding programs. Although they are based on a strict grid, the posters, tickets, books, brochures, uniforms, signage, and architectural graphics in this exhibit clearly demonstrate the playful humanity and exuberance that simple elements of icon, type, color, and texture are capable of producing when in the mind and hands of a master designer. 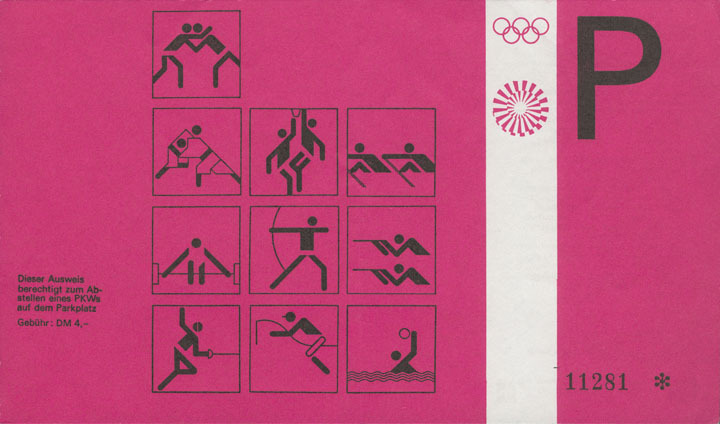 Included in the exhibit are artifacts from the planning to the implementation of the 1972 Olympics, along with many of the sports and informational icons conceived for the Games and later expanded on for other applications. 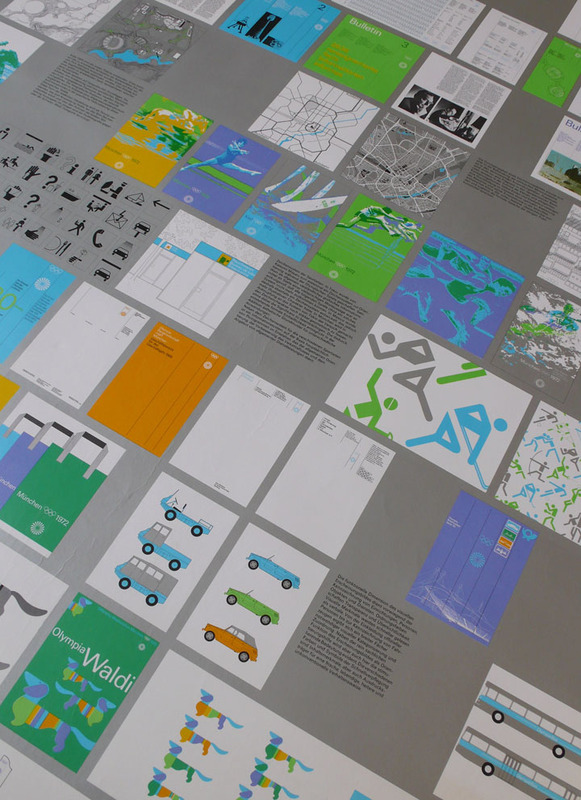 Also on view are Aicher identity programs for the Munich Airport and other clients. The works in the exhibition are from the collection of guest curator Joe Miller, Lecturer in the Graphic Design Program at the School of Art and Design at SJSU, and principal of joe miller’s company, a design office in Santa Clara, California. From February 6 to July 7, 2009 SFMOMA exhibited posters and event tickets from the collection of Joe Miller in the exhibiton Otl Aicher München 1972. SFMOMA curators were introduced to the work of Otl Aicher and Joe's extensive collection at the exhibition Spiele. Portions of Joe Miller's collection are represented in the books Graphic Design, Referenced, Armin Vit, 2009, and Graphic Design, Translated, Peter Wolf, forthcoming 2010.